App Cooker by Hot Apps Factory is a highly advanced and fully featured iOS mockup editor for the iPad specifically designed to help any iOS developer or development team create outstanding applications and reap huge profits in the easiest and shortest way possible. The App Store is a huge success, no matter how you see it. After just 3 years, it now has 425,000 apps with over 15 billion downloads. Needlessly to say, it has been a gold rush to both Apple (netting as of this writing $ 3 billion in sales) and iOS developers (Apple reportedly giving out $ 2.5 billion to iOS developers. Both figures courtesy of www.9to5mac.com). We have all also seen and read how numerous iOS developers and their respective applications became instant hits overnight amassing huge profits. (remember the “Doodle” application or “Angry Birds?”) With those in mind, almost all iOS developers are out looking for the “next big thing,” the next iOS application that will propel them to App Store fame and fortune. Because of this, a sudden surge of iOS applications have bursted on to the App Store scene. In fact, there are so many applications out there in the App Store that at one time, it was used by Apple to market their iOS device line – up. (remember the iPhone ad “There is an app for that?”) With all these numbers, and the sheer volume of available applications on the App Store, making the next big thing in iOS is a huge feat. That is the time when the guys at Hot Apps Factory came up with this brilliant idea: if truly, “there is an App for that,” then why not create an iOS app specifically for iOS developers? An iOS application created by iOS developers for iOS developers. Thus came App Cooker. There are a multitude of mockup iOS app editors available in the App Store, but none as complete and as advanced as App Cooker. 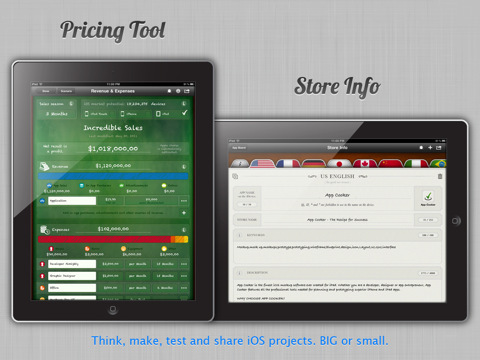 App Cooker literally is the only tool you would ever need to imagine, plan and create an iOS application. 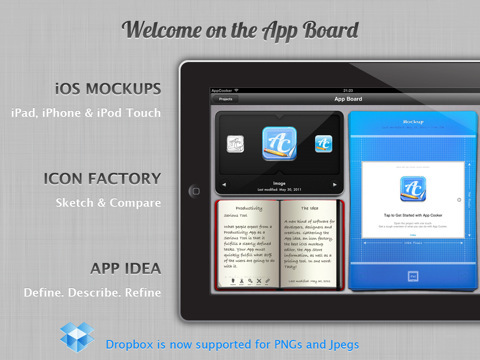 Upon opening the application, users are presented with the different “App Boards” for their iOS applications. Inside each App Board, users will find all the tools they need for great iOS application development. 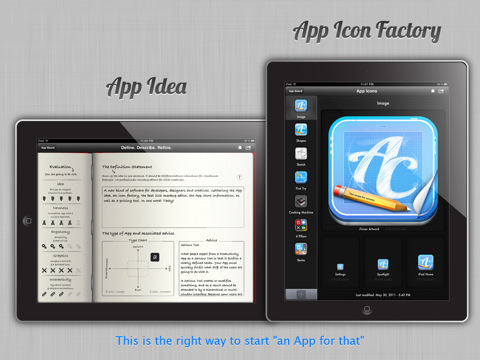 App Cooker has an iOS Application Icon Editor, allowing users to create drafts of their application’s icons. The iOS App Icon Editor allows users to create icons either by drawing them directly, or importing them from your iPad’s camera roll. App Cooker also has a neat iOS mockup editor. Here users can create wireframes of their iOS application, giving a “look and feel” for their app even before development starts. But the killer features of App Cooker has to be the Define, Describe and Refine tab, the Pricing Scenario tab and the Store Info tab of each App Boards. I used to be an application developer and designer for a different platform long ago. One of the challenges I used to face everyday was I had so many ideas about my application that I needed a “focusing tool” or “focusing tools” that would allow my thoughts to be aimed and filtered at my application’s ultimate purpose and goal. And, with App Cooker’s Define, Describe and Refine tab, the Pricing Scenario tab and the Store Info tab, they are the exact “focusing tools” I am referring to. The Define, Describe and Refine tab in each App Board in App Cooker is a perfect “checkpoint tool” for any iOS application project. Here, users can The status of their iOS application, whether is is currently being developed, or it is already in the App Store. Users can rate their application on the left side panel, depending on their app’s Idea, Newness, Ease of Use, Ergonomy, Graphics and Interactivity. The Evaluation Panel on top when then give the user a brief status of your application. The Definition Statement TextBox allows the user to clearly define their app’s purpose, while the Type Chart would allow the user to identify the type of app that they have. The Advice panel is just that: it gives sound advice on how your app should be, depending upon the values you have encoded in your Type Chart. The Store Info tab and Pricing scenario tab are a dream when launching your iOS app into the App Store. In the Store Info tab, users can create drafts of how their iOS app will be presented on the App Store, even before they ever do pass their app for Apple’s approval. Users can define their app’s keywords, ratings (final ratings are of course subject to Apple), app name, etc. The Pricing Scenario tab is just excellent. In here, users can create pricing schemes for applications, adjust trial periods, lower or increase prices, etc. The Pricing Scenario intuitively estimates the profits and costs each scenario has, and the user can input as many scenarios as they want. These figures, although just estimates, helps any iOS developer or development team plan their strategy in marketing and selling their respective iOS applications. – Pricey; App price could be lowered by creating DLC’s for other features. AppSafari review of App Cooker – Design, Mockup & Prototype Apps Interfaces was written by John Tinio on July 13th, 2011 and categorized under App Store, Developers, iPad apps, Productivity, Utilities. Page viewed 6287 times, 1 so far today. Need help on using these apps? Please read the Help Page. Want to win a promo code for App Cooker?